The Curious Wavefunction: The fine-tuning problem in protein folding: Is there a protein multiverse? The fine-tuning problem in protein folding: Is there a protein multiverse? One of the deepest questions physicists have struggled with in the last half-decade is the so-called "fine-tuning problem". The fine-tuning problem asks why the values of the fundamental constants (Planck's constant, the speed of light, the mass of the electron etc.) are what they are. The reason why physicists are so worried about the values of these constants is because presumably if the values were even a little different from what they are, the universe and life as we know them would not exist. For instance, even a slight weakening of the strong nuclear force that holds nucleons together would prevent the formation of atoms and thus of all complex matter. Similarly, a slight change in the electromagnetic force would fundamentally alter the interactions between atoms crucial for the formation of chemical bonds between the molecules of life. There thus seems to be some factor during the evolution of the universe responsible for fine-tuning the values of the constants to their present values within an incredible window of accuracy. The fine-tuning problem is a real problem not least because some religious believers point to the unchangeable and precise values of the constants to be the work of some kind of intelligent designer. In the last few decades there have been a few attempts to resolve the fine-tuning problem. Probably the most exotic and yet in some ways the most reasonable solution has been to assume the existence of multiple parallel universes. Multiple universes (or multiverses) were first proposed by Hugh Everett, a brilliant and troubled physicist who worked on nuclear weapons targeting, as a way around the so-called "measurement problem" in quantum mechanics. The measurement problem is fundamentally embedded in the quantum description of our world. The unsettling thing (and one that troubled Einstein) about quantum mechanics is that it assigns probabilities to certain events, but provides no answer as to why only one of those events materializes when we make a measurement. Everett worked around this conundrum by assuming that in fact all possible events actually do take place, but only one of them is part of our universe; the rest of the events also occur, but in parallel universes. Everett's interpretation which was regarded to be a fringe explanation for years (thus making it successfully into science fiction books) is now taken seriously by many physicists. Being a problem associated with the most fundamental constants of nature, the fine-tuning problem makes its way into all "higher-level" sciences including chemistry and biology. In chemistry the fine-tuning problem takes on a fascinating form and entails asking why certain molecules have become fundamental to living systems while other more or less equivalent alternatives have been discarded during evolution. For instance, why alpha amino acids (and why not beta or gamma amino acids)? Why left-handed amino acids and right handed-sugars? Why phosphates and not sulfates or silicates? In retrospect one can think of answers to these questions based on factors like stability, versatility and ease of synthesis, but ultimately we may never know. However, the fine-tuning problem also manifests itself in one of the most fundamental processes in the workings of life; protein folding. The protein folding problem is well-known; given an amino acid sequence, how can a protein fold into a single three-dimensional structure and reject the countless number of other possible structures it can fold into? What is even more remarkable about this problem is that several thousand of those other structures are almost equienergetic with the preferred folded structure and yet they do not form. In fact it is this energetic equivalency between several structures that plagues all modern computational protein folding algorithms; the problem is not so much to generate the one correct structure as it is to distinguish it from other structures that are very close to it in energy. The fundamental assumption in all these algorithms is that the correctly folded structure is the lowest-energy structure. But that does not mean it differs in energy from the other solutions disproportionately. Therein lies the rub. Ever since I heard about the protein folding problem this issue has bothered me as I am sure it has others. Consider that the free energy difference between two different protein structures may be only 5 kcal/mol or so, about the energy of a single hydrogen bond. Yet a protein when it folds unerringly picks only one among the two structures. How can nature manage to pick the right solution every one of millions of times when it folds proteins inside our body each second? To put it another way, here's the "fine-tuning problem" in protein folding: why does a protein always adopt one and only one correct structure even when many other structures, very similar in energy and presumably in function, are available to it? From a retrospective evolutionary standpoint the answer to this conundrum is perhaps not too surprising. Imagine what would happen if every time a newly synthesized copy of a given protein folded, it formed a slightly different structure. This heterogeneity and lack of quality control would play havoc with the intricate signaling networks in our body. Evolution simply cannot afford to have different three-dimensional structures for the same protein, no matter how slightly different they are. No wonder that quality control in protein folding is extreme. Of course nature does make occasional mistakes, but wrongly folded proteins are quickly degraded and destroyed. Nonetheless, the original dilemma persists and metamorphoses into a further interesting question: isn't it possible for a protein structure that is slightly different from the one true structure to be functional? There are two possible answers here. Perhaps the alternative structure was functional during evolution at one point, but competition from the slightly better structure weeded out the former from the gene pool. If this is the case, could there be a chance that there is some unknown form of life in which this other slightly different yet perfectly reasonable structure still exists, happily doing its job with no evolutionary pressure around to discard it? The best way to answer this question is to compare proteins from different species, something that has been extensively done for years. But such a comparison usually reveals protein homology, in which the sequences themselves are slightly different and yet perform similar functions. That's not what we are looking for. What we are looking for is "two" proteins with absolutely identical amino acid sequences which in two different creatures adopt slightly different three-dimensional structures and perform similar functions. Or they could even perform different functions, thus validating evolution as a force that puts slight differences to optimal use. Let us call these proteins with identical sequences but different functional folds "fold mutants". To my knowledge such fold mutants have not yet been found. A second albeit more exotic solution to the fine-tuning problem appeals to a possible "protein multiverse". The argument here is that the kind of protein structures which we observe are indeed not the only feasible or functional ones. There are in fact other structures which are not only well-folded but also functional. For some reason, evolution, during its intricate dance of maintaining order, structure and function, chose to discard these structures in favor of ones that were more functionally relevant in this universe. However there is no reason why they could not have been picked in a different universe, where the laws were slightly different. There is another way to think of a protein multiverse; as a set of valleys and peaks where the valleys correspond to different folded structures. Such a metaphor has also been used by physicists to argue that our universe with its own set of fundamental constants corresponds to one local minimum in this "multiverse landscape", with other universes populating the other dips. Similarly we could imagine a protein multiverse landscape in which different protein folds occupy different valleys; we favor a particular fold only because it inhabits our own valley, but that does not stop other folds from corresponding to the others. In a different universe, hemoglobin could have folded into a marginally different structure in which it bound not oxygen but some other small ligand like ammonia more efficiently. Such a fold mutant of hemoglobin would be useful to creatures which survive in an ammonia-rich environment (ammonia in fact has a greater temperature range as a liquid compared to water). Or one could imagine a fold mutant of carbonic anhydrase, which catalyzes the conversion of carbon dioxide to bicarbonate at a different pH or a different temperature. Fold mutants of known proteins could have every conceivable property different from their original "correctly" folded counterparts, including shape, size, polarizability and stability. The fold mutants could be exquisitely adopted to living conditions in their parents universe. Their special folds could be stabilized by environments differing from those found on earth in ionic strengths, hydrogen bonding capabilities and hydrophobicities. For a given protein, this alternative fold could in fact be the lowest in energy and its companion fold found in our universe could be slightly higher in energy. This kind of speculation immediately suggests two explorations. One is to look for fold mutants in other parts of the universe. This search would be part of the search for extraterrestrial life that has been going on for years. But the point is that if we happen to find fold mutants of existing proteins on other planets or in other inhospitable environments, these mutants would provide powerful support for the solution of the fine-tuning problem. They would tell us that the fine-tuning problem exists only in our narrow-minded anthropocentric imagination, that there could indeed be many folds of the same protein that are robust and functional and that we just happen to inhabit a part of the universe that stabilizes our favorite fold. The other more readily testable experiment asks if we can produce different functional folds from the same amino acid sequence by varying the experimental conditions. It's of course well-known to crystallographers and protein chemists that slight changes in physicochemical conditions can play havoc with the structure and function of their proteins. But most of the times these slight changes in conditions produce misfolded protein junk. Is there an example of someone slightly (or even radically) varying conditions in a test-tube and producing two different folds of the same protein that are both stable and functional? If there is one I would be very eager to know about it. On the other hand, if it turns out that it's impossible to find two different functional folds for a single protein, such an observation might well lend credence to the physicists' multiverse with differing fundamental constants. It might well be that under the present values of fundamental constants, it is impossible to stabilize a slightly different protein fold and make it functional. Perhaps only a slight albeit conceptually radical restructuring of the fundamental constants could result in a universe that is friendly to fold mutants. Such a universe would still enable the creation of complex matter through the appropriate combination of the constants, but it would indeed result in life very different from what we know. The protein multiverse could thus help resolve the fine-tuning problem in protein folding and make biochemists and physicists part of the same multiverse fraternity. More importantly, it could once again reinforce the diversity of creation. One could have different universes with the same fundamental constants but different protein folds or different universe with entirely different combinations of the constants themselves. Take your pick. If uncovered, such diversity would only echo J B S Haldane's quote that the "universe is not only queerer than we suppose, but it is queerer than we can suppose". "isn't it possible for a protein structure that is slightly different from the one true structure to be functional?" Yes, this is true. Although x-ray crystallography has led many biologists to believe that proteins are static entities, newer structure determination techniques like NMR have provided pretty good evidence that proteins exist not in a single native state but in a collection of similar structures referred to as the native state ensemble. A good example here is ubiquitin. Ubiquitin is a small protein that can tag other proteins and, as a form of post-translational modification, it gets recognized by many other proteins. Structures of ubiquitin in complex with various ubiquitin recognition proteins show ubiquitin adopting a number of different conformations in these different complexes. Remarkably, when researchers examined the NMR structure of ubiquitin to search for "invisible" excited states (low population states visited transiently by ubiquitin), they see evidence that ubiquitin, by itself in solution, can visit all the conformations that it adopts in the various protein-protein complexes it forms (Lange et al., Science 320, 1471 (2008)). Thus, it seems ubiquitin is functional precisely _because_ it's native state is capable of adopting a number of different conformations. Related to this point, many enzymes exhibit promiscuity; that is, they can act on molecules other than their primary substrate. This promiscuity is likely related to the conformational flexibility of the protein (i.e. the active site being able to switch to an alternative conformation which can accomodate other ligands). This promiscuity is likely important in allowing the evolution of new enzymes that target new substrates or perform new reactions. "Let us call these proteins with identical sequences but different functional folds "fold mutants". To my knowledge such fold mutants have not yet been found." These "fold mutants" have indeed been found and are referred to a metamorphic proteins. Although rare, biochemists have found examples of proteins that exist in equilibrium between two very different folds. Examples of such metamorphic proteins include lymphotactin (R. L. Tuinstra et al., Proc. Natl. Acad. Sci. U.S.A. 105, 5057 (2008)) and Mad2 (M. Mapelli, et al., Cell 131, 730 (2007)). You might also be interested in reading the following review article in Science which deals with some of these issues in the context of thinking about how protein dynamics may guide protein evolution (a topic in which I am very interested): Tokuriki and Tawfik. Science 324, 203 (2009). Thanks for the comments and references. However my question is not so much about different dynamically interconverting functional conformations as it is about different folds. I am aware for instance that protein monomers do sample minor conformations which become functionally relevant when they bind to their partners and I am not surprised that functionally relevant ubiquitin conformations exist as minor ones in the monomer (in my own research I have observed the same thing for small molecules- the bioactive conformation is sparsely populated in solution). But I am more interested in actual folds. I believe that biochemists have classified proteins into several families of folds. Apart from the very interesting lymphotactin reference which I will check out, is there an example of the same protein crystallizing in two different fold families or entirely different folds (but ones which may be similar in energy), both of which are functional? After all in principle you can have quite dissimilar folds that are nonetheless very similar in energy. Membrane proteins often adopt multiple conformations that are significantly different. E.g., the important signaling protein ErbB2,whose pair of TM helices are thought to adopt at least two significantly different conformations (active and inactive) with very different N-terminal and C-terminal contacts. See also many transporters, e.g., ABC transporters etc. Of course, particular environmental conditions select the dominant conformation, but multiple conformations are encoded by primary sequence in some sense. By the way, accurate building of native conformations is highly non-trivial, not just scoring or discrimination of 'the' native state. As much as this crossection of topics is natural for my current study topic of astrobiology, it is quite removed from the nuts and bolts of it. However, much as I suspect that a theoretical chemistry know more quantum physics than I have ever needed to know, the physics here is somewhat conflated. Generally in physics, fine-tuning problems occurs when parameters must be adjusted to high degree to agree with what is seen. Typically this happens in theoretical physics because parameters of normalized equations deviate much from the natural order of ~ 1. Then large positive and negative factors have canceled very precisely for no obvious reason. So there isn't a specific fine-tuning problem. Nor does many physicists obsess with what some call "the fine-tuned universe". This is the idea that the type of universes that admits life being seen depends on fine-tuning of parameters. I call that "the religious fine-tuning argument" to separate it from bona fide problems that are in fact intended to be solved. Because as many have pointed out any sensitivity disappears when you co-vary several parameters. 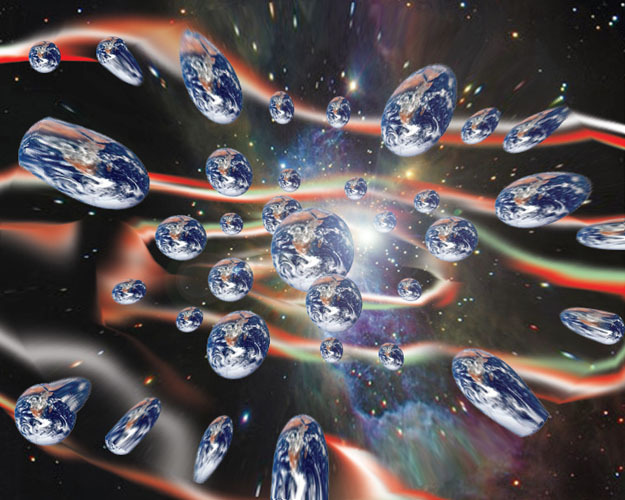 Physicist Vic Stenger claims that ~ 50 % or the parameter space gives universes similar to ours (i.e. can have stars) when you vary orders of magnitude around us. Similar numbers have been mentioned by others looking into it. These two problems should be separated. One class of identified problems may be bona fide hard physics problems. One specific idea doesn't seem to be such a problem at all. The confusion are encouraged by religious debaters. [cont.] This is related to the idea of multiverses, as you mention. There a similar conflation often appears. The Many World Theory of Everett is deeply connected with quantum mechanics, say of proteins, however it isn't the type of multiverse that most often is used for predicting fine-tuned parameters. Those cosmological universes split off classically instead of quantum mechanically. Cosmological multiverses can be used to predict parameters by way of the weak anthropic principle; if parameters have a distribution, observers would be most likely to be found in the parameter region where they arise most easily. Here again we see what amounts to a confusion encouraged by religious debaters. Corresponding to "the fine-tuned universe" they maintain that observed life arise with difficulty, that it is rare or unique in any not only in our universe but in the multiverse so the environmental theory doesn't apply. I call that "the religious anthropic argument" to separate it from bona fide anthropic principles that are in fact intended to be solutions. Note the nice symmetry, when physicists find there is little sensitivity to parameters religious debaters claim there is much, when physicists find it is useful to assume sensitivity religious debaters claim there is none. But when Koonin did the same to in effect claim that with many worlds with abiogenesis attempts there would be a chance for at least one success, however little, he seemed to be unaware of the existence and usefulness of the weak environmental principle. In effect using multiverse/many worlds ideas wrongly. Good to see the same things about proteins exercising you that have been bothering me for years. If I understand you correctly, the reasons proteins have one shape in a rather flat potential landscape with many minima all quite similar in energy, is kinetic -- they fold to it faster. That's OK as far as it goes, but to stay at this minimum, the potential barriers surrounding it must be quite high, and relatively unique to the final form, otherwise it would find its way to other minima. It still seems rather miraculous to that one structure could do all this. Even more miraculous is the way 'evolution' found it out of the myriad possible amino acid sequences. Incremental improvement in amino acid sequence has been proposed as a way of finding the proteins which make us up, but I find this unconvincing. Torbjörn: Thanks for your comments. To be honest I too do not buy the fine-tuning argument. In fact if you treat the constants as variable parameters as the current universe as a good fit, then one can definitely think of other combinations of parameters which would result in a similar system. It would be similar to other modeling exercises. Luysii; The argument *is* thermodynamic. The kinetic barriers can be large but the folded state is assumed to be the thermodynamically most stable one. I actually don't have a problem accepting that nature manages to fold proteins to the one correct structure every single time- after all we do know of other very finely tuned processes like DNA replication and translation. The question that bothers me much more is the assumption that all other folded states are non-functional, and what bothers me the most is the fact that we cannot produce other functional folded states by varying experimental conditions. I think prion proteins and instrinsically unstructured proteins are examples of what you call "fold mutants".